Rich Hall (born 10 June 1954 in Alexandria, Virginia) is an American comedian and writer. He was a writer and performer on the sketch comedy TV series Fridays, Not Necessarily the News, and Saturday Night Live. He has appeared several times on the American talk shows Late Show with David Letterman, and Late Night with Conan O'Brien and on British comedy panel shows QI, Mock the Week, 8 out of 10 cats, Have I Got News for You and Never Mind the Buzzcocks. In 1986, he had his own Showtime channel special, Vanishing America, which was turned into a book with the same title. 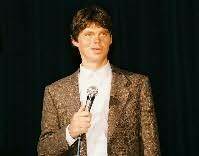 He hosted a talk show during The Comedy Channel's 1990-1991 season, entitled Rich Hall's Onion World. Rich Hall coined the term "sniglet" (a word that "doesn't appear in the dictionary, but should"), and collected and published several volumes of books of them. Matt Groening has described him as the inspiration for Moe Szyslak from The Simpsons. He lives in London, United Kingdom with his wife, Karen, and daughter, Dixie Rae.